With the last years’ worth of talk about passenger rail between here and Chicago, there is a vivid battle on our local papers’ comment pages between the “that would be nice” faction and the “they’re just trying to get re-elected, where will the money come from?” team. 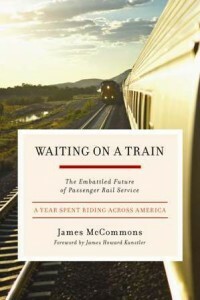 Before taking a side, one might wish to peruse this fresh book by James McCommons, Waiting on a Train: The Embattled Future of Passenger Rail Service. This one isn’t gathering dust on our shelf. People are using it no doubt to bolster their arguments. That being said, how cool would it be for Cubs fans and the 75% of the University of Iowa students from Chicagoland? Or, nationally, anyone spending two hours riding the bus in Los Angeles for lack of infrastructure?